YAY ME! YAY ME! YAY ME! Little Happy Dance! Woo-hooo!!! Ok let me settle myself. 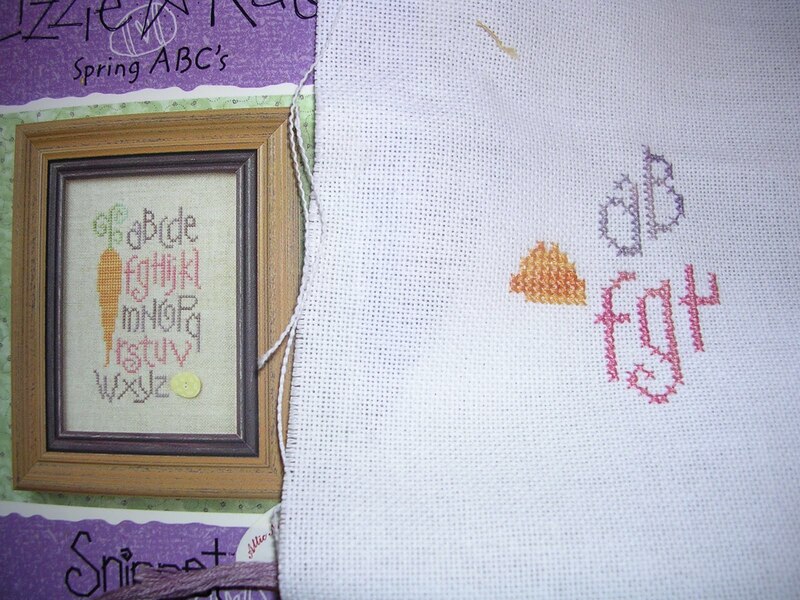 This is my first finish from all the projects I started for the 2012 Crazy January Challenge. I like Lizzie Kate's they are cute and small and bright. 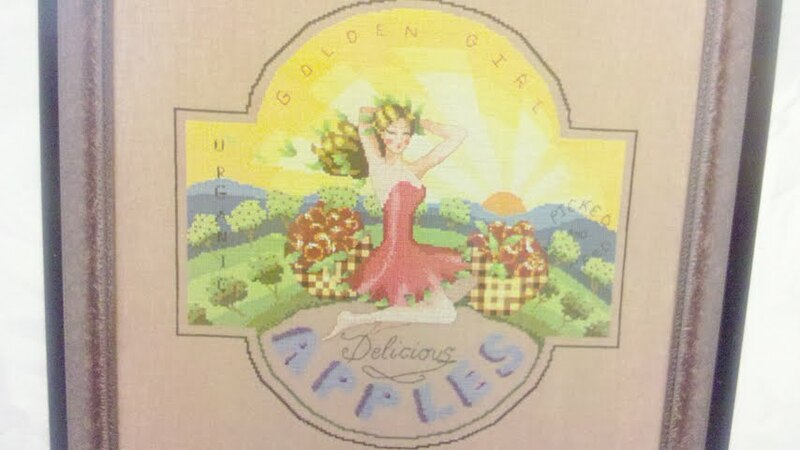 I found the cute easter fabric at Jo-Anne's, I want to make this into a little ornie/pillow. I also want to find a cute little bunny button for the lower corner of the alphabet. I thought the chick/easter egg buttons would do, but when I got them home they were way bigger than I thought, and I really want a bunny to go along with my carrot. Sigh, so still searching for my bunny button to finish this. And I will just have to find another Easter piece to start on, because the little chick buttons are too cute to stay in my button jar for long. And I wanted to take another (better) picture of my Bent Creek "Home" piece, so that everyone could see the lovely shading in my letters. I so love the color (Weeks-Moss) I picked out for this. And for once I actually snuck outside in the daylight to take a quality picture. Yay me again! I have worked on my other 15 pieces for the January challange, but nothing to exciting so I will save those for another post. 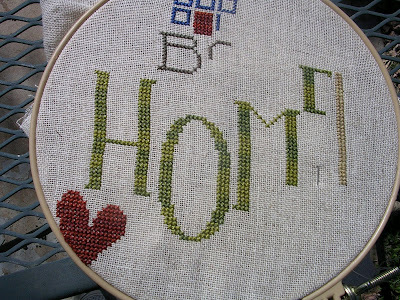 So this is my day 10 project for Crazy January Challenge, Bent Creek "Home". This last year has been my year for Bent Creek patterns. I changed the colors of the letters, and used "Moss" by Weeks. 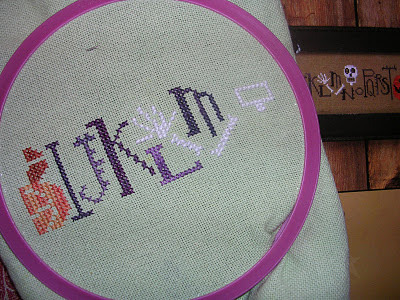 I really like how variegated it looks on the lettering, which of course you can't see in my dim photo of it. Trust me, and next time I'll use better lighting for my pics. It's hard to get natural daylight when most of my photos are taken after little ones go to bed. 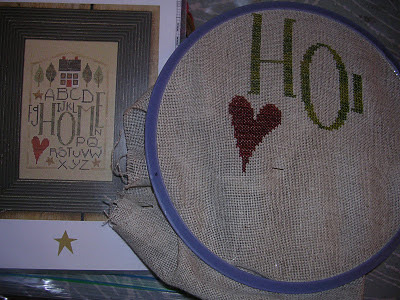 I started another Bent Creek for day 11, The big zipper "Go with all your Heart". There will be no pictures, I hate it!!! It came as a kit with the Perl Cotton threads included. Well I have never stitched with them before. So at first I wasn't sure if I was supposed to separate strands, like with DMC. I tried separating them (didn't work they fuzzed immediately). 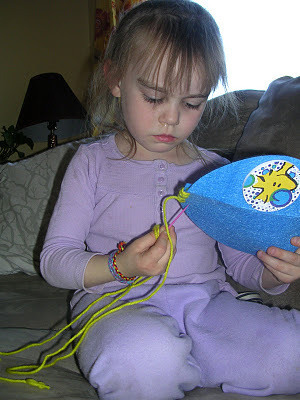 Then I tried sewing it as one strand which felt like I was sewing with yarn. I also was working on a 28ct evenweave instead of the recommended 18ct linen. So I will be ripping out the first hours worth of stitching and starting again. I also spilled coffee on the edge of the fabric (I know! I know! drinking and sewing I should be ashamed!) So it seems like this project was fated to fail. I still would love to finish this design. 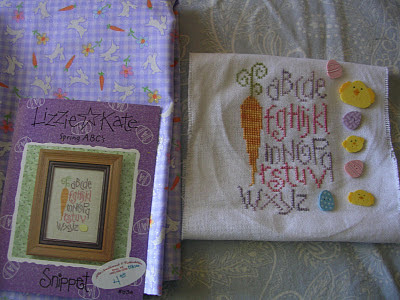 Wagapapa is stitching it on her blog, which is what prompted me to finally go out and get it. It looks so cute! And this is my Day 12 project. A change up from all the Bent Creek, Lizzie Kate "Halloween Rules". I was fretting over what to stitch this on. I actually went out and bought 3 different linens. 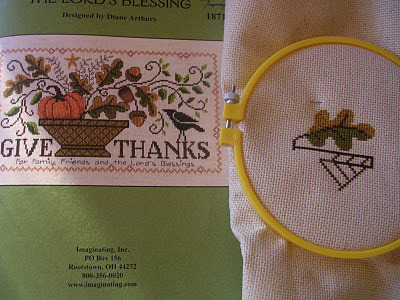 I wanted a pretty golden color like the linen in the picture. But didn't want to special order it and couldn't find one I liked at my LNS. I actually was putting off starting this because I just wasn't sure what to stitch it on. So I dug through my stash box of linen again, and was lucky enough to find a big enough piece of 32ct Laguna. I have a habit, a bad habit, of saving things for a "special project". I never want to use what I have in my stash, because it's too nice for whatever I am working on. Well this is going to be a big peice, and i really like the design and will probably have it professionally framed. I realized if that's not nice enough to use my stash linen on, probably nothing will be and it will be sold someday by my children at a yard sale for a quarter having never been stitched on by me. First at the top is off of an old Prairie Schooler chart #51 Garden Beasties. 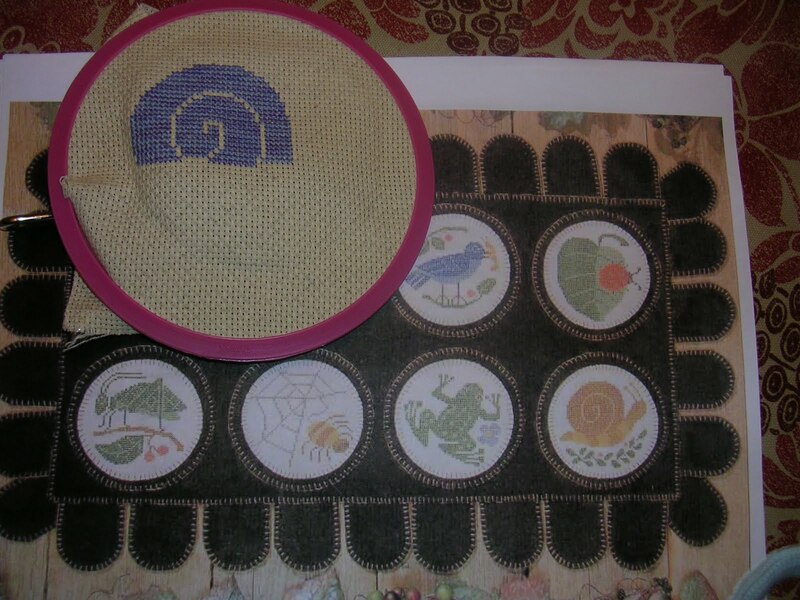 I changed the colors on Mr. Snail to a periwinkle purple and his body I am going to do in greens. This was my day 5 stitch. Next up is another Mirabilia, Petal Fairy. If I can get her done in time I would love to have her framed by spring. 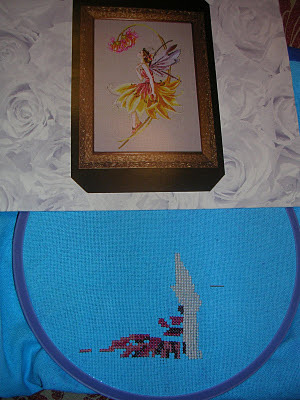 I remember Halloween Fairy stitching up pretty quickly so I hope she is the same. I hand dyed the evenweave. I saw a picture online of it done in this color and loved how it made the yellows and pinks in her dress stand out so well. She was day 6, I tried to plan to work on the Mirabilias on the weekends, so I would have more time to give them. Day 7 was a smaller Lizzie Kate. I wanted to mix in smaller pieces since I promised myself I would not add any new projects into the rotation until I finished something. 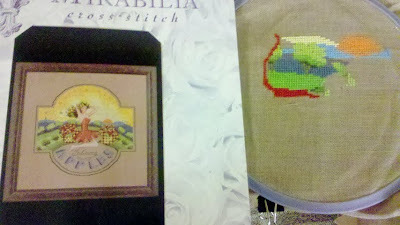 I also thought about saying I would stitch something from the same designer I finished, but since half my list is Bent Creek I worried that might get boring. I am also going to try and keep them in order to work on, so each should get about 2 days a months if I keep up the 15 project rotation. I know it's a complicated system even for my little brain. This is what I worked on today, Day 8. Spooky Row by Bent Creek. I love the rows because they are generally quick for me to finish. 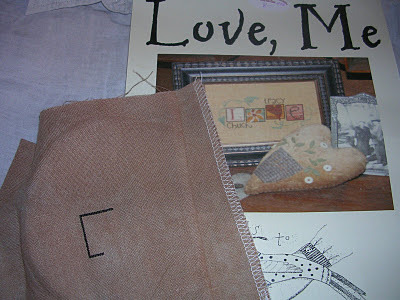 I hand dyed the linen again, it turned out a little lighter than I had hoped. I was going for a Frankenstein green, and it came out more pastel green. I am hoping once I stitch it with all the dark colors and add a dark frame I will like it a little more. And this is my +1 day, day 9 started early. It is a Hands to Work design. Another designer I don't stitch too often. I liked that I could personalize it with our names. I have the best boyfriend ever, as yesterday he patiently waited while I spent a very excited hour in my LNS ooohing and aaahhing over all the new designs I hadn't seen since I hadn't been in there since pre-Thanksgiving. So this one was picked out for him. 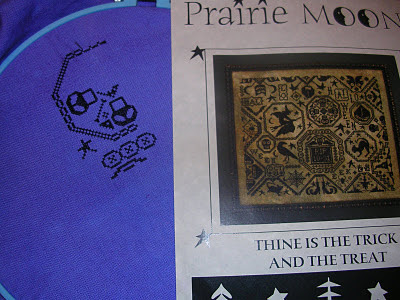 It also edged out another Prairie Schooler design from my list, so I spent part of this afternoon editing my list and will need to get it posted to my sidebar somewhere. Perhaps that can be my goal for next post, I hate fussing with the blogger gadgets. 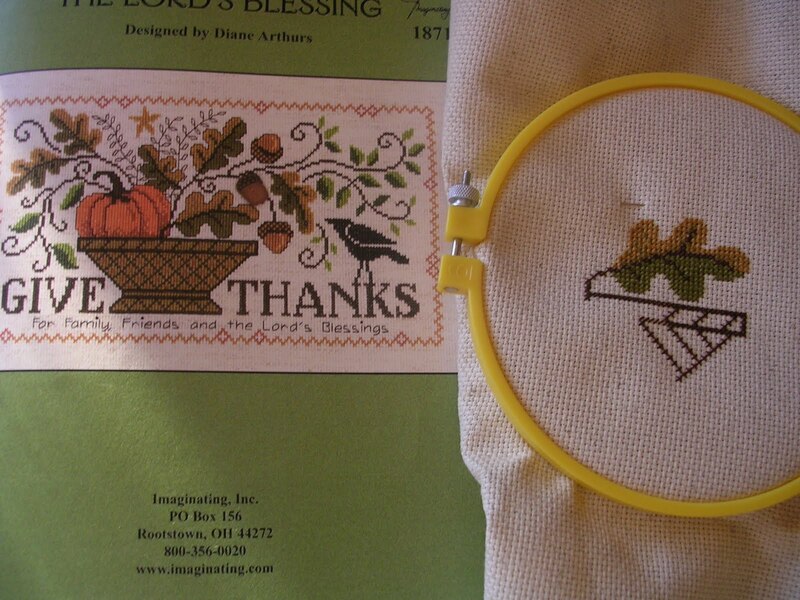 This is a Dianne Arthur's peice again, "The Lord's Blessing". Another Autumnal peice. As with the Halloween start hopefully this one will be done in time to hang up for the season. I am stitching it on Aida, which I have gotten away from using, and it is so crinkly and stiff that it's scratching up my arms. Hopefully it will soften up a little soon. 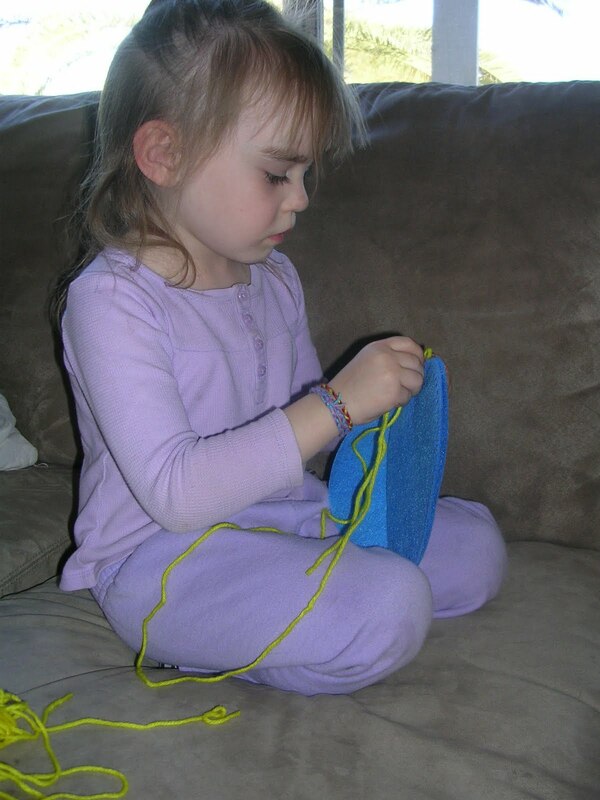 And this is my 5 year old learning how to sew. My oldest made a Hello Kitty purse, and entered it into the state fair last year. Well of course anything big sister does, little sister has to do too. Besides keeping the yarn on the needle, she did pretty good. I had to promise her she would get to enter it into the state fair this year. I think she was a little jealous last year when both mommy and big sister won ribbons, and all she got was a ride on the carousel and some fry bread at the fair. 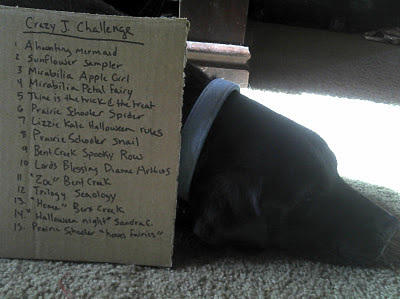 This is my day 3 project for the Crazy January Challenge, being posted on day 4. I stayed up until the wee hours working on it last night, and by the time I was done stitching I didn't have the energy for posting. 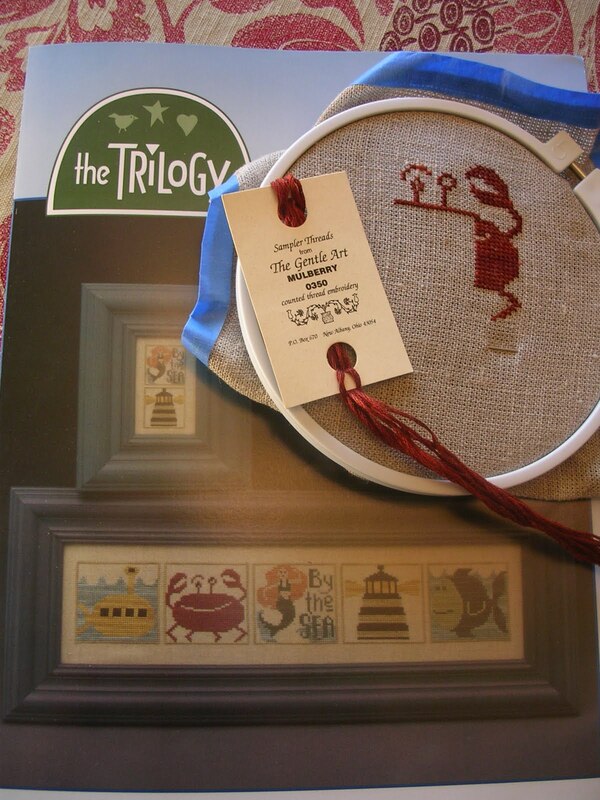 It is "Sea-ology" by the Trilogy. Another designer I don't stitch very often. This challenge is expanding my stitching repertoire. I like the color I chose for the crab, I was debating between this one or a brighter red like "liberty" or "Louisiana hot sauce" by Weeks. So this morning I started in on one of my New Years resolutions. They are pretty much the same as last years: Be more Organized, Be more Healthy, and Be more Creative. I was working on the healthy one this morning. My 8 year old asked if she could ride her bike to school, and I thought I would run next to her pushing the jogging stroller with my 5 year old in it. It's about 8 blocks to her school, making it a 2 mile round trip. Easy workout right? What I didn't factor in was that I normally ride my own bike next to her, and the last time I was on foot while she rode was when she was 5 and had just gotten her training wheels off and I was holding on to the back of her bike so she wouldn't tip over. A motivated 8 year old is WAY FASTER than a wobbly five year old. WAY FASTER!!! So this morning I looked like exactly what I was: a slightly out of shape -sweaty -30-something mom -about to have a heart attack while trying to keep her New Years resolution. By the time we made it to the school I was too out of breath to even say good morning to the crossing guard. But it did motivate me to keep lacing up my Reeboks until I can make it look easy (or I really do keel over in a sweaty mess on the sidewalk). Really whichever comes first. And this is Day 2 of the Crazy January Challenge. 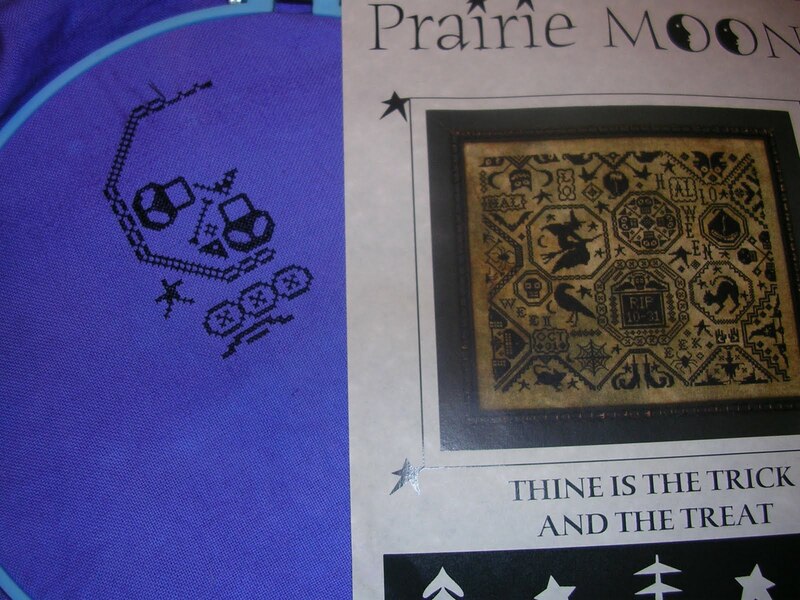 It's "Thine is the Trick and the Treat" by Prairie Moon designs. 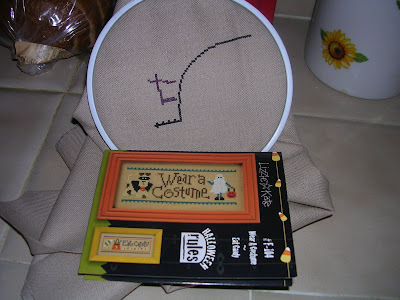 I have never stitched one of their designs before, but I saw this last Halloween at the Spinster Stitcher's blog, and loved it. I also love her blog, she is so funny (and her little dog Stewey too). Anyway I figure this will be nice to have in a rotation since I tend to get bored just doing on color, and this is a whole lot of DMC 310. I hand dyed the evenweave for it last night, and managed to splash a bit on my shirt. So later that evening as i'm changing into my jammies, I am looking at my belly and wondering how I got that huge purple bruise. It took me a few seconds before I realized I had also managed to hand dye myself in the process. I like the color the linen turned out, it's not as blue as the picture makes it look. I hope everyone is having a great start to their New Year. Mine started with getting ready for work this morning, stepping out of the shower after washing my hair, and having all the power go off. So today, all day long at work, I have looked like I was out way too late partying. When the truth of it is I was sound asleep long before any balls dropped or fireworks went off. Sigh, hopefully this isn't indicative of the rest of my year. So I have started a new challenge. Something I have never participated in before. 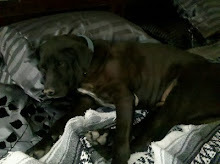 I joined the Crazy January Challenge 2012 Yahoo group. I know, like I need to start anymore projects. I was surprised (well not really) at how easy it was to pick out all the charts I wanted to start. Here is my list, modeled by my elderly black lab. And here is my first new start of the new year. This is the brand new just released Mirabilia chart "Golden Apples". 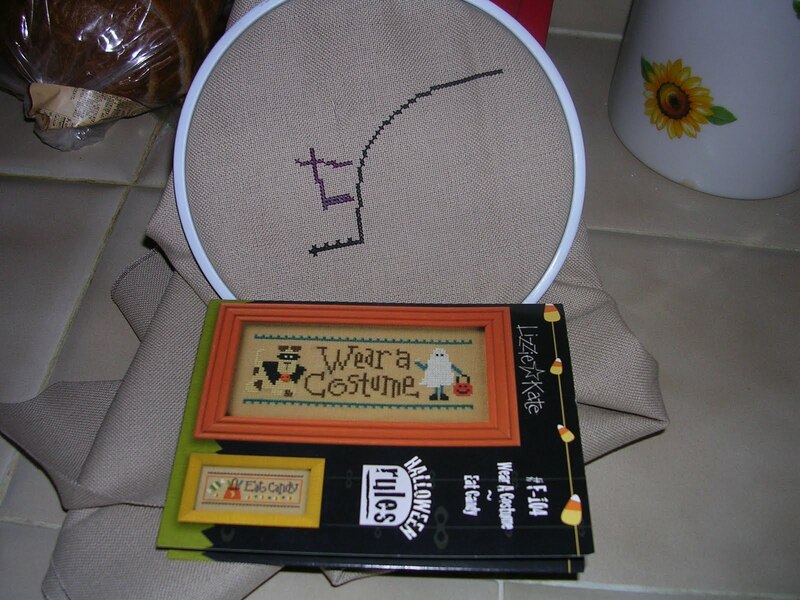 I have stitched 2 other Mirabilias over the years (Halloween fairy/Shakespeares fairies) but never finished either. Not for lack of enthusiasm for either chart, maybe for lack of skill/patience. You may notice on my list I have 2 Mirabilia's planned to start. Finger's crossed at least one of them gets finished. Remember last year when I asked everyone what stitching the face "over one" meant on a Mirabilia? Well I am going to be brave and try it on both. I figure it's a small-ish area and DMC thread, so what have I got to lose?